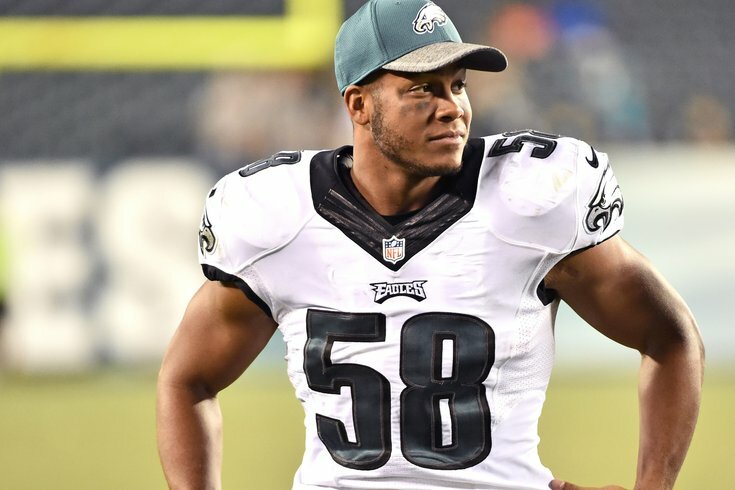 Jordan Hicks is a good, young player, but can the Eagles count on him long-term? Now that the Philadelphia Eagles' offseason is (finally) underway, let's take a look at each position and figure out which players will be back in 2018, and which ones will be playing elsewhere. Here we'll look at inside linebacker. 2012 (Texas): Missed final 10 games after suffering a hip flexor injury. 2013 (Texas): Played four games, then ruptured his Achilles and was done for the season. 2015 (Eagles): Missed final eight games with a torn pectoral muscle. 2017 (Eagles): Missed the rest of the season after rupturing his Achilles Week 7. Hicks will be playing on the final year of a cheap rookie contract in 2018. He's not going anywhere, but the Eagles will have to decide if they can count on him to stay healthy long-term. Jordan Hicks: Stay or Go? Ellerbe was a late season rental after an assortment of linebackers didn't work out. He is unlikely to be back in 2018, though the team could keep him on speed dial during the season just in case. Dannell Ellerbe: Stay or Go? Goode is a versatile linebacker and special teams contributor, which has enabled him to survive on the roster seemingly forever (he joined the team in 2013). Goode is a free agent this offseason. #JimmyVerdict: I would imagine the Eagles will once again bring Goode back on a veteran minimum deal, and he'll probably make the team, like he usually does. Najee Goode: Stay or Go? To make room on the roster for Sidney Jones to play in the Eagles' meaningless Week 17 game against the Dallas Cowboys, the Eagles decided to place Walker on injured reserve with a pre-existing neck injury. In his opportunities to play in 2017, Walker often struggled, though it's fair to point out that he was only a year removed from a torn ACL. #JimmyVerdict: Walker will be back in training camp in 2018 and should be healthier than he was in 2017, but he'll have to earn a roster spot. Joe Walker: Stay or Go?